Much of Morris County depends on groundwater for its potable water needs. While droughts typically have a more immediate effect on surface water systems (reservoirs and rivers) than groundwater systems (wells), drought conditions are still a concern. The MCMUA's water system depends essentially on groundwater consisting of 8 wells; 6 in the Alamatong Wellfield and 2 in Flanders Valley). Several of these well are deep in limestone formations and less susceptible to seasonal droughts. With the October 21, 2016 signature of Administrative Order No. 2016-10 by NJDEP Commissioner Martin, the state placed 14 counties in North, Central and Northern Coastal New Jersey under a drought warning due to ongoing precipitation deficits and depleted water reserves,	particularly storage levels in reservoirs. Morris County is included in this drought warning. As of late October 2016, MCMUA wells are at normal levels for this time of year. MCMUA wells are monitored on a continuous basis electronically using fixed transducers which measure drawdown and static levels and recorded on our data collection and control system. 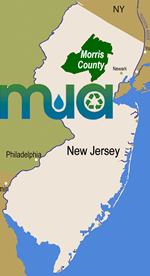 The MCMUA always encourages its municipal customers to support and practice prudent conservation measures; examples of which can be found on our website under Water Conservation Practices. DEP also posts such practices.